Over 4,250 West Ham match going supporters have already filled out the 2019 London Stadium since it was published last Wednesday. Now in its third year, the 20 question survey is designed to gauge changing perceptions and experiences of fans to the London Stadium since the Hammers move in the summer of 2016. Supported by a number of different West Ham websites, blogs and social media accounts, the survey was completed by over 10,000 match-going supporters in previous years. 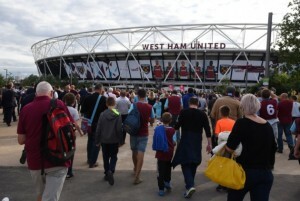 The 2019 survey takes around three minutes to fill out and is designed only for those who have visited the London Stadium in person to sample one or more West Ham games this season. Please base your answers on your most recent visit to the London stadium to recognise areas which may have improved. A copy of the results of this survey including all comments will be shared with the West Ham board of directors and all supporters after the closing date of 11 pm Sunday 24th March. SURVEY CLOSES AT 11 PM TONIGHT – LAST CHANCE!